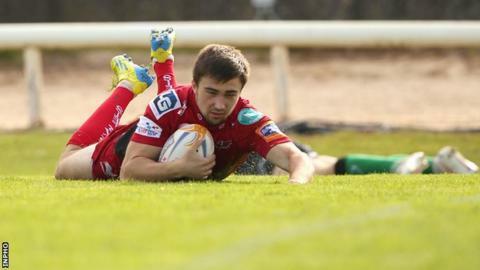 Teenager Jordan Williams' two second-half tries helped Scarlets beat Connacht in the Pro12 clash in Galway. A Miah Nikora penalty and Eoin Griffin's try helped the home side lead 8-0 at the break. However, Scarlets took control in the second half with Williams (two), George North and Jonathan Davies scoring tries and Rhys Priestland and Williams adding conversions. Connacht's only score of the second half was another Nikora penalty. Nikora, excelling at fly-half with the injured Dan Parks watching on, put the hosts ahead with a 10th-minute after a scrum offence by Samson Lee. A Willie Faloon surge set up a try chance for the home side but skipper Gavin Duffy failed to hold Tiernan O'Halloran's pass. However, Connacht did cross the try-line a minute before the interval as a superb pass from Nikora set up Griffin to score out wide. Just 45 seconds after the restart, wing North burst through to create an overlap and pass for full-back Williams to slip over for his first try, which Priestland converted. With the visitors finding their groove in attack, North then scored a try of his own as he brushed past Duffy's attempted tackle on the right to score another five-pointer. Another missed tackle cost Connacht dearly as Williams evaded Griffin's grasp to score again to the left of the posts, extending the lead to 17-8. Connacht responded with a penalty from Nikora on the hour mark and they pushed hard for a match winner until Davies intercepted Nikora's high pass in injury-time for a long range gallop to the line. Connacht: Gavin Duffy (capt); Tiernan O'Halloran, Eoin Griffin, Dave McSharry, Fetu'u Vainikolo; Miah Nikora, Kieran Marmion; Brett Wilkinson, Ethienne Reynecke, Nathan White; Michael Swift, Mike McCarthy; Andrew Browne, Willie Faloon, Eoin McKeon. Replacements: Adrian Flavin for Reynecke 31, Denis Buckley for Wilkinson 59, Rodney Ah You for White 59, David Gannon for Swift 69, Johnny O'Connor for Faloon, Dave Moore for Marmion 70, Matthew Jarvis for O'Halloran 50, Robbie Henshaw for Griffin 62. Scarlets: Jordan Williams; George North, Jonathan Davies (capt), Scott Williams, Nick Reynolds; Rhys Priestland, Gareth Davies; Phil John, Matthew Rees, Samson Lee, Sione Timani, Richard Kelly, Josh Turnbull, Johnathan Edwards,Kieran Murphy. Replacements: Ken Owens for Rees 41, Peter Edwards for John 66, Deacon Manu for Lee 41, Jake Ball for Timani, Rob McCusker for Turnbull 61, Aled Davies for G Davies 61, Aled Thomas for Priestland 73, Gareth Maule for North 66.